alternative if you are vegetarian, but you want to taste the feeling of the Hungarian goulash. The Mushroom stew is also very good if you are on diet and you want to lose some weight, as it can be made in a low-fat version. Some people in Hungary abstain from eating meat during Lent and Advent. So during this period they cook Mushroom stew if they desire goulash. 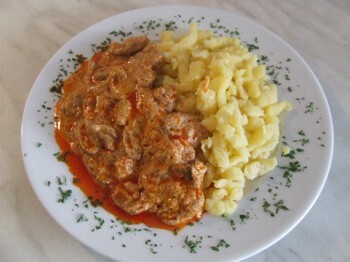 I also like this Hungarian food as it is much lighter than the original Hungarian goulash. So, let me share you the recipe of Mushroom stew. What should you buy or take from the shelf? First of all you have to clean and slice the mushrooms and the onions and dice the green pepper. Fry the onion on some oil until it is wilted, then add the mushrooms, the diced green peppers, some salt and ground black pepper and paprika. Steam the all the ingredients until most of the water has evaporated. If you want to have more juice in the Mushroom stew you can sprinkle the mushrooms with flour while they are being steamed, add some water and boil until everything is cooked well. If you want to make Mushroom paprika, just add some sour cream, added to the flour while the mushrooms are being steamed. We are serving this traditional Hungarian food with Galuska – Little Hungarian Dumplings. You can find the recipe of Galuska just the end of the page about Hungarian Goulash. I hope your first Hungarian Mushroom stew was a great success. I’m always happy to hear about your success stories, so please share it with me. If you have questions or you have some problems with the recipes, please contact me and I’ll help you.